Anywhere in an organized town. Within 200 yards of any occupied dwelling. On cultivated or pasture land used for agricultural purposes in an unorganized township if someone is living there. When trapping for beaver that can be legally accessed via water. When trapping with the use of drowning sets on state-owned land and on public rights of way. When trapping with the use of drowning sets along navigable rivers and streams on privately owned land as long as the traps are set at least 200 yards away from any occupied dwelling. Note: Although it isn't required to obtain written landowner permission before setting traps, setting traps on privately owned land is not permitted if the landowner indicated they do not want a person to trap there, either by a conspicuously posted sign or by word of mouth. Tearing down or destroying a fence or wall. Leaving open any gate or bars on another person's land unless they were open when found. Cutting trees or removing branches from trees. The Inland Fisheries and Wildlife Landowner Relations Program is working towards enhancing the relationship between landowners and land users. With approximately 94% of the land in Maine in private ownership, everyone must respect all landowners and their rights as landowners. All landowner wishes have to be followed by all outdoor recreational participants to help ensure access and use of private property in the years to come. Trappers are expected to abide by a higher standard of landowner permission than any of the other outdoor recreational participants. This standard is a law that requires written permission from the landowner before going on someone else's land to set traps, except for beaver. 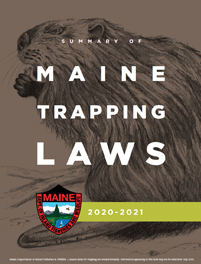 Because trappers have done a great job abiding by this requirement, there is now a better understanding of trapping by landowners and the public in general. Contacting the landowners for permission does put an extra burden on the trapper. However, the one-on-one communication between the trapper and landowner plays a vital role in improving landowner relations - not only for trappers - but for all outdoor recreational participants. Although you are not required to get written permission before trapping beaver on land you do not own, you are not allowed to go on another person's land to trap beaver if the landowner has asked you not to go there, either verbally or by posted notice. We receive several complaints each year where trappers have set up on a beaver colony that the landowner does not want removed. Please make every effort to avoid this type of conflict. You can do that by communicating with landowners prior to the opening of the trapping season as to what their wishes or concerns may be. The law covering abuse of another's property contains several prohibited acts, but the one most likely to be encountered by a trapper is the cutting of trees or branches on the land of another. Cutting is not allowed without landowner permission. We would like to thank all trappers for the excellent efforts they have displayed in helping us improve landowner relations. What you do does make a difference.